In this week leading up to the biggest DC movie event ever, the debut ofBatman v Superman: Dawn of Justice (still a mouthful), we’ve got a hardcover release of volume 7 of Justice League from Geoff Johns with art by Jason Fabok. 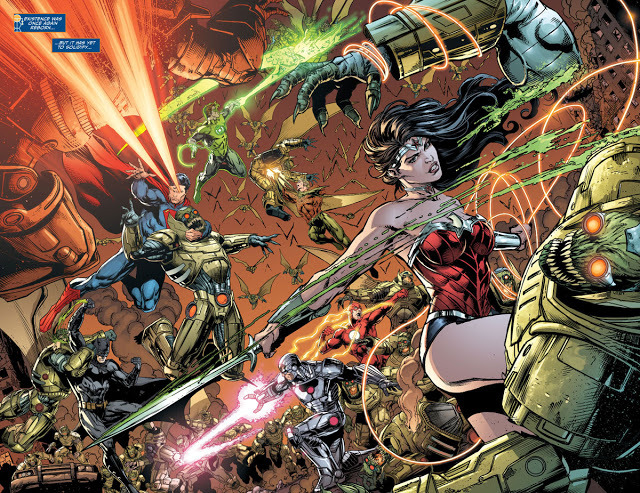 Volume 7: Darkseid War Part 1 pits the New 52 Justice League against a reimagined Fourth World and introduces some new and interesting characters for the modern age. These are definitely comics more skewed toward the longstanding DC Comics fan than the casual reader, but if someone were to wander off of the streets and grab this hardcover in preparation for the movie (a scenario often prescribed by comics journalists like myself, but rarely do the masses imbibe) they may be entertained but will certainly leave with a lot of questions. Johns, recently announcing yet another ‘Crisis’ aka Rebirth, lays the groundwork for the theory of the DC multiverse in Darkseid War. Besides the usual cast on the side of the righteous, we see Darkseid pitted against the powerful Anti-Monitor and a view of how these worlds came to be.